Edge-X is a revolutionary technology that creates tailored lighting distributions from a shaped optic at the edge of a waveguide. It enables unprecedented control over the photon as soon as it emerges from the LED, using refraction rather than reflection to sculpt light in three-dimensional space – all from a module-sized luminaire. This means that previously unimaginable luminaires and distributions can be created. For instance, a downlight that also has an indirect, uplight component, while still virtually vanishing into the surrounding architecture. By shaping the optic at the edge of the waveguide, Edge-X is able to produce precise distributions that have never been accomplished by conventional waveguide technologies before. 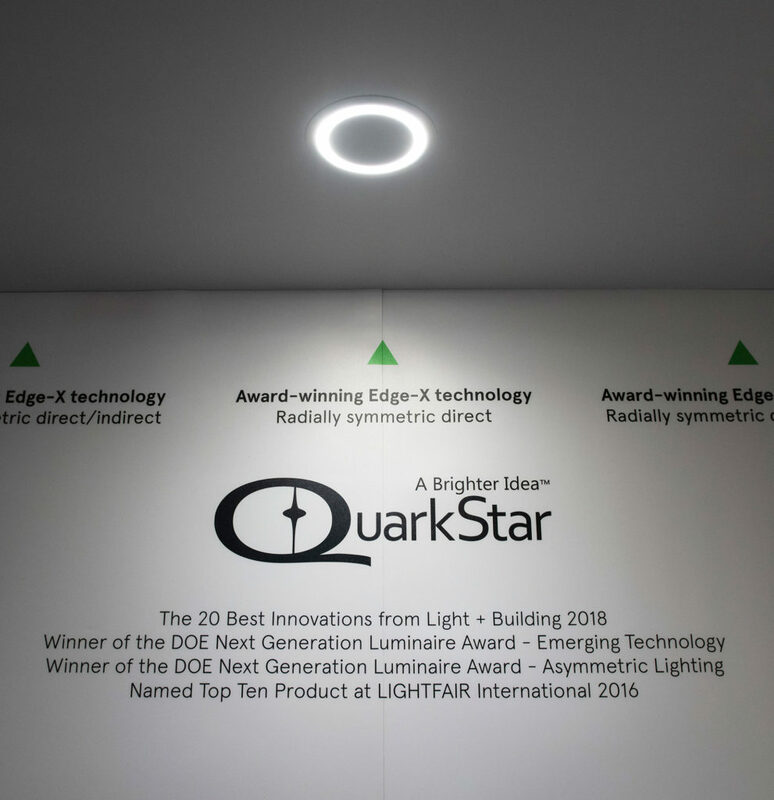 Examples include award-winning asymmetrics, such as a wall-wash that has a uniformity ratio of 3-to-1 compared to an industry average of 10-to-1, and creating downlights that can also include an uplight component. Luminaires should either vanish into the background architecture or act as a centerpiece. With Edge-X, luminaires can be tailored to achieve either effect with ease while still maintaining precise control over light distributions. Unlike conventional waveguide products, Edge-X does not use the waveguide as a light-emitting surface. Instead, it acts solely as a guide and mixing chamber. Thus, it can either be recessed completely, or it could be in full view without worrying about becoming a glare issue. As a completely clear optic, it virtually disappears into an installation. 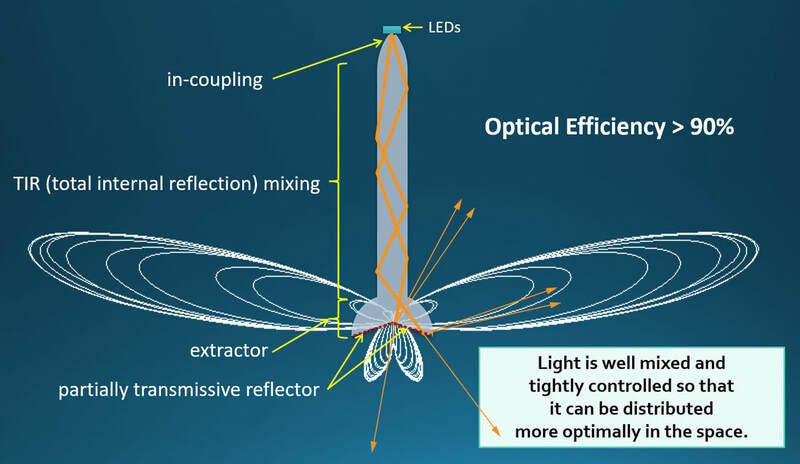 If a centerpiece is desired instead, since the component for controlling light distribution is simply a narrow piece at the edge of the waveguide, luminaires designed with Edge-X technology can easily be designed into elaborate showpieces while still delivering beautifully sculpted distributions. Glare is caused by large amounts of light directed at undesirable angles. If the light is directed correctly outside of these glare-zones, then no glare is produced, no matter how bright the LEDs. This means that even as LEDs continue to become brighter and smaller, luminaires designed with Edge-X technology can continue to produce comfortable, beautiful illumination. Edge-X can shape light straight from the optic. Thus, a full luminaire can be reduced solely to the light engine and primary optics, eliminating the need for a larger housing to hold diffusors or reflectors. By reducing the entire luminaire down to the module level, cost savings can be realized from the reduced materials costs of manufacturing to the logistics of shipping and storage. 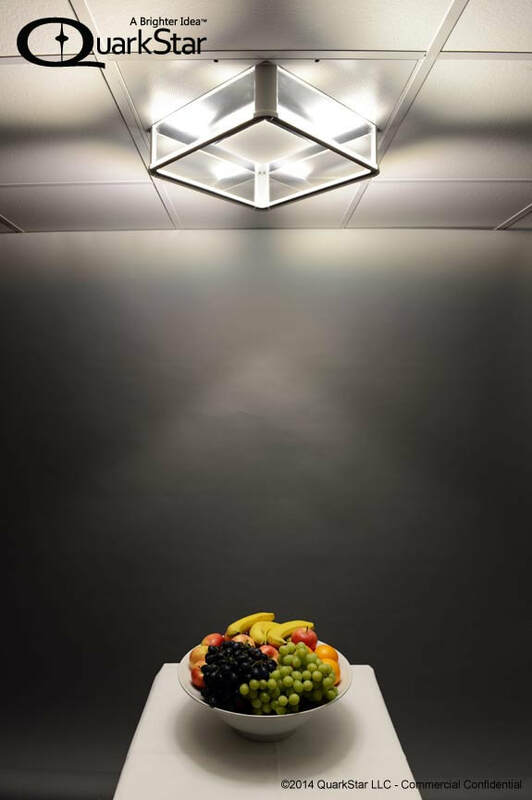 The undeniable trend for solid-state lighting technologies is that sources are becoming smaller and brighter. But rather than creating more (sometimes literal) headaches, with Edge-X, glare and light distribution control is not only not a problem, but the luminaire can take advantage of the smaller and more powerful source. Future generations of Edge-X can scale down to even smaller versions, while still producing beautifully sculpted distributions. Nearly every photon is captured directly at the source and funneled directly to the optic, where it is directed exactly where it’s needed. Guided by one of QuarkStar’s team members Roland Haitz’s philosophies, that photons are a terrible thing to waste, Edge-X’s patented coupling technology minimizes loss at the source and there is virtually no loss in the remainder of the optical train. 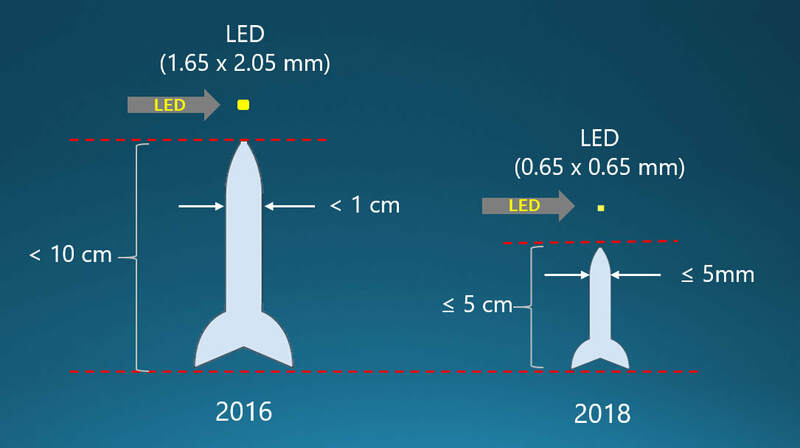 This means that for all categories of luminaires that produce similarly shaped distributions, Edge-X has the highest optical efficiencies that can be realistically produced. The LED is as different to previous sources of lighting as the incandescent bulb was to fire. 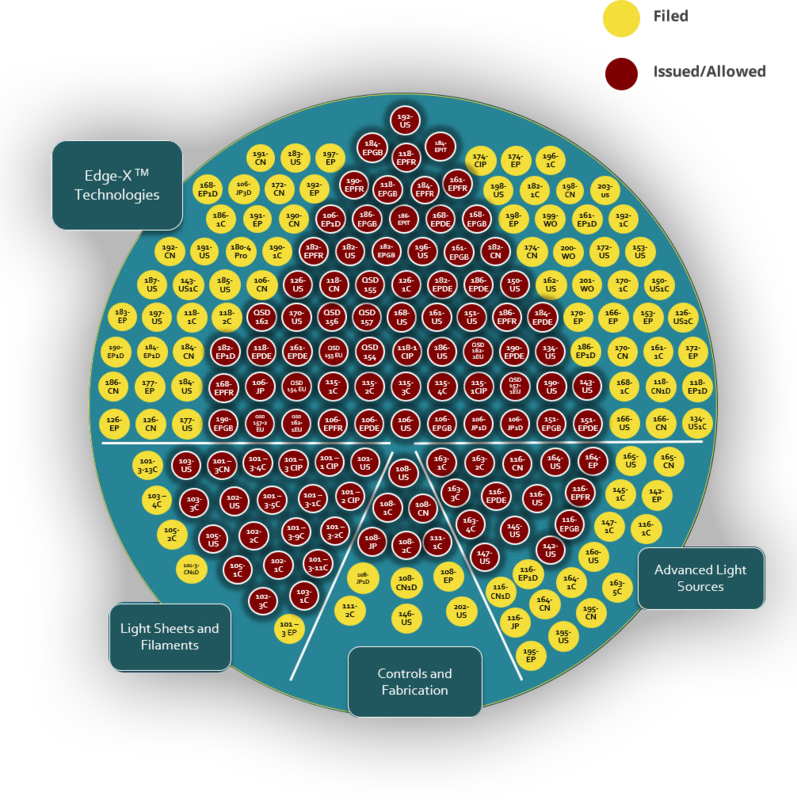 The Edge-X not only enables radically different luminaire design, but also radically different capabilities that have been impossible till now – and all defended by a global patent portfolio that includes over 400 filings with over 150 patents already granted.